Coupon must be presented at time of service writeup. Plus tax, not valid with any other offer. See dealership for complete details. With the temperatures dropping and roads getting icy, the condition of your brakes is crucial. If your brakes are slow to respond, pull to one side, or deliver reduced stopping power, it's time to get either your front or rear brakes replaced at Eddy's Toyota. With this special offer, you can replace your front or rear brakes for $199 on a car or $209 on your pickup. Our Eddy's technicians are experienced with brake replacement and will ensure that your replacement brakes are properly installed so that you can drive with confidence. 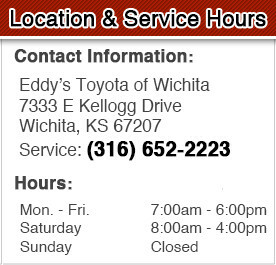 Don't forget to print this coupon and save on your front or rear brake replacement at Eddy's Toyota.